Descending into Carlsbad Caverns through the Natural Entrance. The switchbacks are just the beginning of a 70-story descent. Deep in the Caverns, the scenery makes it worth the hike. The elevator, out of commission due to long-delayed maintenance. We got as far as the rest rooms, then it was a long climb back to the daylight. White City, NM – Visiting one of America’s natural wonders sounded pretty easy. 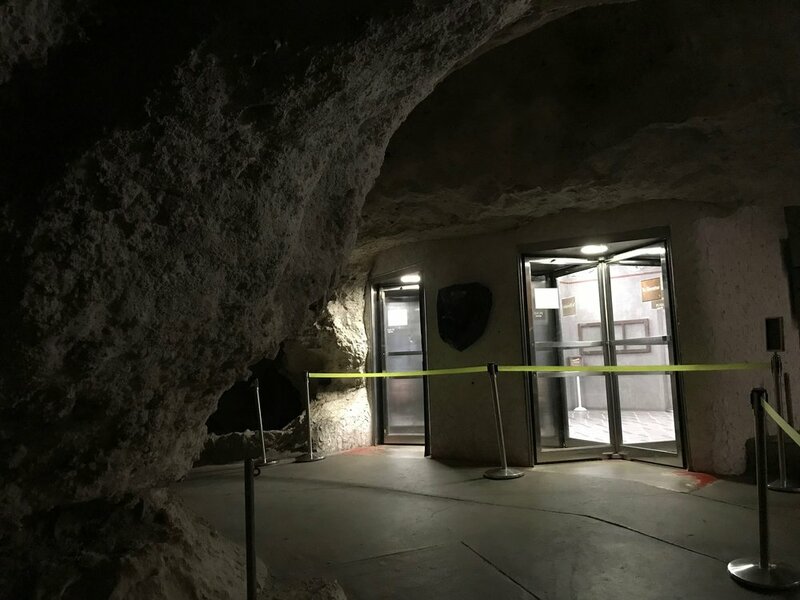 You take an elevator down into Carlsbad Caverns, get out and explore. 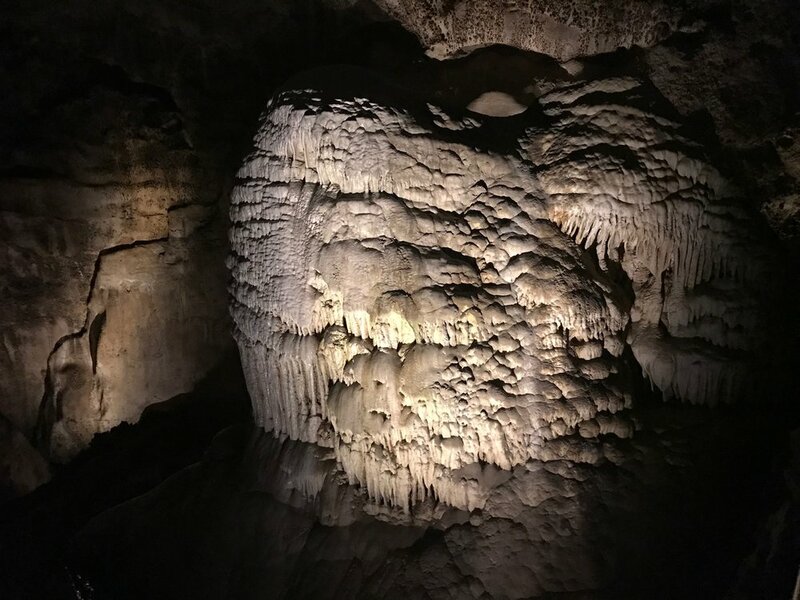 The Big Room Route, the most popular path, is described in the brochure as an easy “stroll” through dimly-lit chambers decorated with stalagmites, stalactites and all shapes of geological features. There are rest rooms and even a snack bar at the bottom of the elevator. We could get a light lunch before jumping on the elevator for the ride back to the surface. Getting to Carlsbad Caverns National Park is the hard part. It’s in the southeastern corner of New Mexico, a long drive from anywhere. The cave walk itself sounded like a breeze. We didn’t find out until we walked through the front door that the elevator was broken. The National Parks Service ranger explained that the elevator had broken down the week before, stranding three tourists who had to be hoisted out in harnesses. The only way in is down the Natural Entrance Route, a steep, winding trail featuring switchbacks and narrow passages that takes you down 750 feet to the rest rooms, snack bar and the dead elevator. No wheelchairs, walkers or strollers allowed. We decided to give it a try. This wasn’t the first time an elevator broke, and it came as no surprise to the park staff. The elevator system – two elevators in two shafts, one to be used as a backup – was installed in 1955 and the cables are known to be worn. The park had been in this situation before, with no working elevators from November 2015 to May 2016. Carlsbad Cavern’s broken elevator is a symptom of a larger problem. America’s National Parks have a backlog of $11.9 billion in overdue maintenance. The elevator has been on that list for awhile, needing $41 million in repairs, but there’s just not enough money to cover it. Last year, The NPS got rid of one of the world’s greatest travel bargains, raising the price of its lifetime senior citizens pass from $10 to $80. Then the Trump Administration proposed more than doubling the fees at the most popular National Parks, raising the cost of a day pass to parks like Yellowstone and the Grand Canyon to $70. The fee hikes sparked loud opposition, and the Interior Department retreated. This month they announced entrance fees will be increased, but by just $5. The fee hike should bring in $60 million, which will barely put a dent in the backlog. The administration’s latest proposal is to funnel new revenue from oil and gas leases on public lands and offshore drilling directly into the NPS maintenance backlog. There’s something cynical about pairing an environmental good – stewardship of National Parks – with the threats to the environment posed by expanded fossil fuel development. That’s one reason the plan is unlikely to get through Congress in an election year. In the past year, I’ve been lucky to visit many National Parks, from Acadia in Maine to Big Bend in Texas; Glacier National Park in Montana to Fort Sumter in Charleston, SC; presidential birthplaces, nature preserves, national seashores and national monuments and more battlefields than I can list. They are wonderful places staffed by dedicated professionals and volunteers. There’s not one of them I wouldn’t gladly visit again, including Carlsbad Caverns – if they fix the elevator, that is. The downhill climb was hard on my middle-aged knees, and the trip back up had even young people huffing and puffing. We rested at the bottom, but the snack bar had nothing but water and energy drinks, and it was closing just as we arrived. The trip back was the equivalent of summiting a 75-story building. But you just can’t beat the scenery along the way. We were a little sore the next morning, but the trip was worth it. That doesn’t excuse the broken elevator, though. Without it, the cavern is effectively out of reach for thousands of visitors. We are a wealthy country. There’s no excuse for letting our national treasures fall apart or pricing them out of reach. These are not for-profit theme parks that can charge as much as the market can bear. They are our birthright, bestowed on us by our forefathers. It is our obligation to preserve and maintain them for generations to come. The National Parks are more popular than ever, with more than 330 million visits a year. They are celebrating National Parks Week, starting April 21, with free admissions and special programs, and summer vacation season is coming. Americans ought to show their amazing National Parks some love, and tell Congress to show them the money they need to keep the elevators running.